In today’s schools, each classroom is a diverse and unique place. Every student has their own learning style and pace. This causes some children to fall behind and others to become bored as they master the material presented to them. In order to provide a well-rounded education for each student, we need to challenge them to their utmost potential. 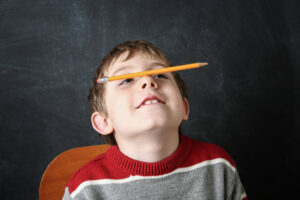 When a child feels as though they are not being challenged, they tend to become bored and a distraction. So how do we challenge each child as we continue to teach our curriculum? When creating your lesson plans, find ways to differentiate the lessons and the materials. While you may not use everything you plan and create, it is useful to have extra materials on hand. Keeping in mind that each child is different will help you to create great and challenging lesson plans. Find different ways you can teach the lesson that could incorporate all learning styles and provide more learning to those who have already mastered the content. “Differentiate the material. It’s more work for you but better for them. Show them how it applies to real life and do other broader activities on the same subject.” –Kandi K.
When you have a child that is bored and distracted, find ways you can relate the content to real life. School and education should help prepare children for things that life throws their way. Presenting a scenario that relates to the content presented will provide further learning opportunities. This keeps your student challenged and eager for more. “[Promote learning] by showing them the ‘real-world’ applications of what they have learned. Make it relevant.” – Vernon L.
As aforementioned, each child learns differently. When you take that into consideration, you can help challenge those that have become bored in class. If your student is a kinesthetic learner, they may enjoy building a model that relates to the content. If they are a musical learner, they may set information from the lesson and turn it into a song or rap. Teaching is full of creative opportunities that help the children to become the best learners they can be. “Apply their knowledge according to their learning style: science experiment, make their own book, design a restaurant, etc.” – Teresa P.
Often times, a child finds it difficult to stay interested when they have already completed the learning for the concurrent lesson. Some children strive when new materials are presented to them. Others, however, need more of a challenge. When possible, take a glance at the upcoming lessons and see how you can tie it into what you are teaching now. Provide them with opportunities to get to that next point to prepare them for what’s to come. Just because they mastered one lesson quickly doesn’t always mean the next lesson will come as easy. Many children enjoy the opportunities to be placed in a position in which they feel needed and helpful. If a student in your classroom is bored and distracting, find ways you can use that student to help his/her classmates. Create a student-mentor/tutor program in your classroom in which students are able to provide their input to their classmates. Allow the child to work with a peer that mildly understand the material but needs a little push to get there. You can also supervise to ensure that he/she is helping correctly. “[I promote learning with] peer leaders/tutors or have the student be my teacher helper to demonstrate their thinking.” – Sarah N.
Continue to Push and Challenge Your Students Always! When you continually challenge and push your students to succeed beyond their potential, you are setting them up for great success in their futures. Find ways that you can implement higher-learning programs in your school and in your classroom. Just as every student is different, every teacher is different. Talk with teachers around you and find out what they do in their classrooms. Connect with teachers online such as on our Facebook page to form more ideas. “We have ‘WIN’ time. (What I need). This is when I push them forward and challenge them.” – Brigitte F.
Many people look back to their school days and say that their favorite teachers were the ones who helped them to be the best they could be. We at Have Fun Teaching believe that each one of you have the potential to be that teacher!